Athens has a natural beauty found in its historic architecture and lush landscaping. A new wood fence from Fence Workshop™ is the perfect way to gain added security or privacy while still maintaining the beauty found all throughout Athens. 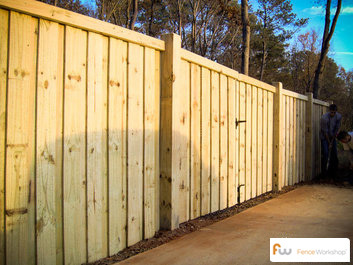 All of our wood fences are fully customizable and built on site which means that we design and build you an excellent and unique wood fence that is built to suit your property in Athens, Georgia. Because we build all of our wood fences on-site, we can easily construct these fences to handle the steepest inclinations and declinations without leaving gaps. These fences are state-of-the-art, as the posts are set in pre-mixed concrete and quick-rok™, in belled holes, making the concrete more than three times the strength of normal concrete and the hole is much wider at the base making it twice as strong, as well. Most wood fence gates (unless otherwise specified), are set on 6×6 posts that stand out more than the other posts, contributing to rigidity and aesthetics. Most commonly in Athens, the lumber we use is a pine wood with a MCQ pressure treatment and cedar. The pine is lighter, more natural looking, and safer (regarding the chemicals used in the treatment). As always, these fences come with Fence Workshop™, 5-Year Installation Warranty. 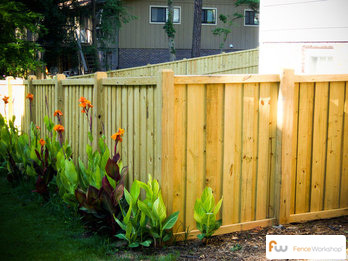 Wooden board fencing can be a beautiful way to set a boundary while still allowing for high visibility. From a simple two rail pine fence to a prominent five rail cross-buck constructed of cypress, we are one of Athens, GA’s largest installer of board fencing and offer a 5-year installation warranty with all fences we install..
As with all Fence Workshop™ fences, our wood board fences are fully constructed on your property in Athens, Georgia. All pressure treated posts are set in belled holes with premixed concrete and quick-rok™ for extra stability and longevity. The fence is fully framed before the wire is stretched to the perfect tension, nailed into place and often followed up with cover boards (1×4 or 1×6 strips of lumber used to hide where the wire attaches to the fence posts and or framing). 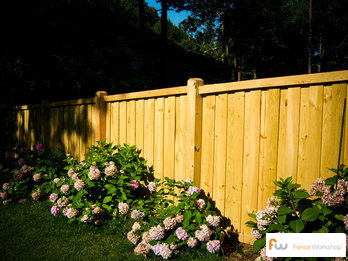 Due to its lower cost, wood and wire fences are most commonly constructed with pressure treated pine lumber in Georgia. Other lumber choices that we offer include cedar, cyprmaximumess and oak. When ready to purchase a wood board fence in Athens from Fence Workshop™, just give use a call toll-free or send us an email to get started. If you already know the style of fence that you want, let us know, along with the footage of the fence, an accurate description of the terrain, the amount and size of the gates that you will be needing and any other necessary specifications. Not sure what you want? Call today and schedule a no-obligation consultation with one of our highly trained and experienced project managers. Vinyl Fences In Athens, GA. Steel Fences In Athens, GA.
Farm Fences In Athens, GA. Aluminum Fences In Athens, GA.